Eureka California has made the trip from Athens to Sylva a few times to play with locals like Unawarewulves and Total War. They play catchy, dance-able 90s-ish indie rock with a bizarre amount of reverb in the vocals. 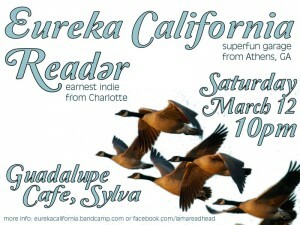 Reader is a Charlotte-based indie band that shades into emo territory on occasion. But we’re not using “emo” as a pejorative here; the singer says his favorite band ever is Sunny Day Real Estate, which is old school. We wholeheartedly support it. View the Facebook event for more info.